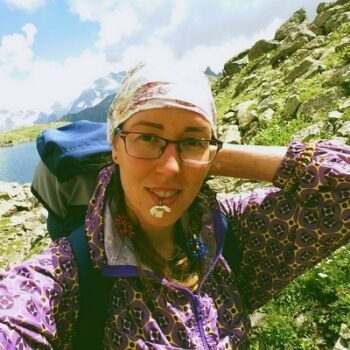 Did you know that the temperature fluctuations when going up a mountain can dehydrate the body and render you ineffective in continuing with your activities? Therefore, you have to agree with us that it’s important to pay attention to the level of hydration of the body and to remember to bring enough fluids when taking a trip to the mountain. The preparation of every hiker should never exclude the best hiking water bottle you can get your hands on, more especially when visiting the areas you are certain about their treacherous temperatures. But, how to know which one is the best hiking bottle for your situation? We know that this is not an easy decision to make, especially if you are new in the hiking hobby. There are tons of bottles with obvious different aspects such as the material and the size to the most unobvious aspects such as insulation and durability. Hikers often get stuck with the pick of the best. We have endeavored to come to the rescue and pick the best ones to keep yourself hydrated. This article brings you a range of hiking water bottles from different manufacturers. We have emphasized the important aspects of each bottle in the reviews, to help narrow your search and help in decision making. But, before we can delve into the actual reviews, we’ve gone through important features to consider before buying, as well as a highlight of the aspects in the table below. Keep reading to find your best water bottle. It is imperative to take into account the important features of each water bottle before making a purchase. 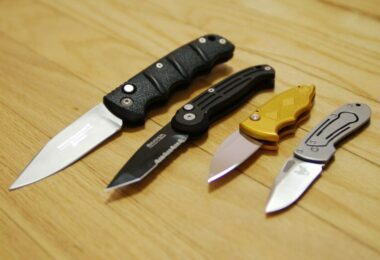 These can include the ease of use, durability, and the weight more especially if you travel by bike or on foot. Balance – Water should be dilated evenly on the left and right side of the backpack and as close to the body. Otherwise muscles fatigue will occur on one side of the body more quickly. Stability – 1kg weight that swings back and forth disturbs the normal rhythm of hiking. Make sure that the water tanks are securely fastened. Excess weight – A water container has its own weight, even when empty. Make sure your containers are lighter in order not to unnecessarily burden yourself with extra weight. Ease of Use – It is very important to be able to easily reach the drinking water and that it is simple to refill it. It’s not good if you have to stop and take off your backpack every time you want to drink water. Sanitation – over time, the bottle must be cleaned. Otherwise various organisms will grow in it. 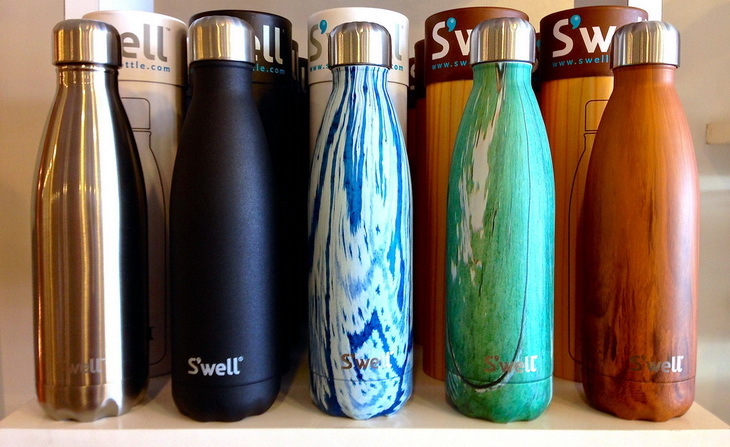 Also noteworthy are the different types of water bottles in the market. Today we have a choice of several different types of water bottles and everyone has to choose the best one for them. Bottles can be standard plastic or aluminum and with varying degrees of heat preservation. They’re easy and they give you the opportunity to carry large amounts of water. Furthermore, they’re cheap and easy to carry when not in use because you can simply fold them and they take up a small amount of space in the backpack. In relation to the amount of water that fits into a foldable water bottle it has very little additional weight. 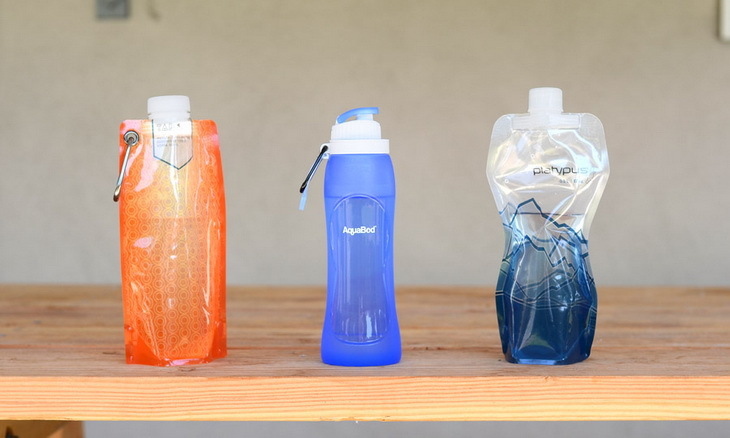 These foldable water bottles are designed mostly for shorter routes where you’ll be able to re-fill it more often. They’re easy to wash and dry too. 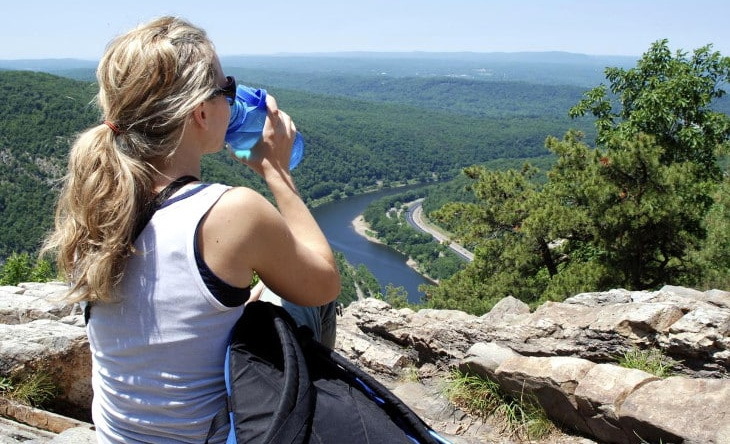 If you use a simple “safe” plastic water bottle it is a very convenient way to carry water when hiking. It’s easy to use, load and maintain. By using two bottles per liter it is easy to deploy in the backpack’s side pockets and is sufficient for 7 – 8 kilometers of walking. These bottles are durable and don’t wither under heat, such as the PET bottles. It’s proven that polycarbonates leach BPA into drinking water so it’s really important that you pay attention to whether the bottle has the BPA-free sign on it. Flexible systems for hydration or water bladders are usually made in sizes for 1 to 3 liters of fluid. They have a very low weight and are extremely stable. They come with a special hose for drinking, which makes it accessible during walking. The only disadvantage of a water bladder is that they can be pierced easily, but if you keep it in your backpack and isolate it from the rest of the equipment, you should not have any problems. The other issue is that you cannot see it when it’s placed in your backpack, therefore, you won’t know how much water you have left. 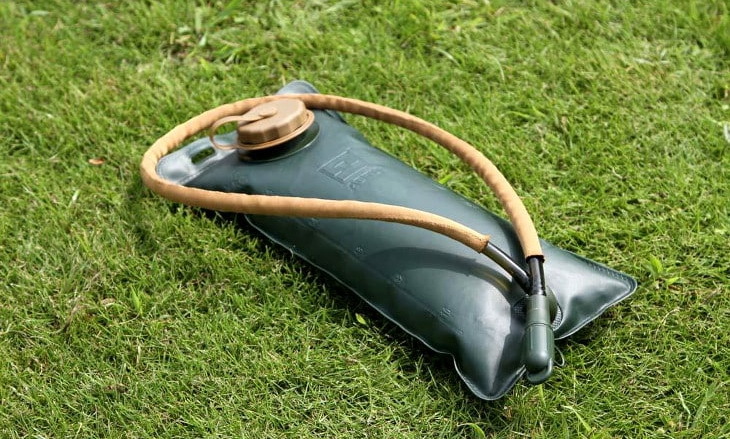 It is also inconvenient for re-filling and maintaining it (in particular the hose), and are expensive when compared to the amount of water they can carry. This is a solid choice as they’re durable and lightweight. The only disadvantage of these bottles is that they’re a bit pricier than the plastic ones. They are trendy and most of them are BPA-free. Although a stainless steel bottle is a bit heavier than the bottles made from other materials, it has many other advantages over other bottles. Many hikers say that this bottle can be used as a weapon too. 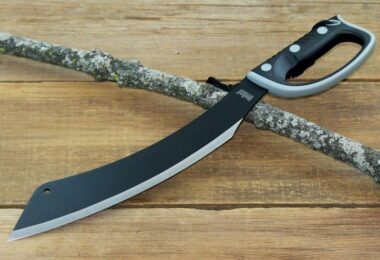 It sounds funny though, but considering the fact that it’s made out of stainless steel you can use it as a defense weapon if you’re attacked by an animal. Also, with steel you won’t have to worry about toxins and other chemicals. The most famous brand is Klean Kanteen. 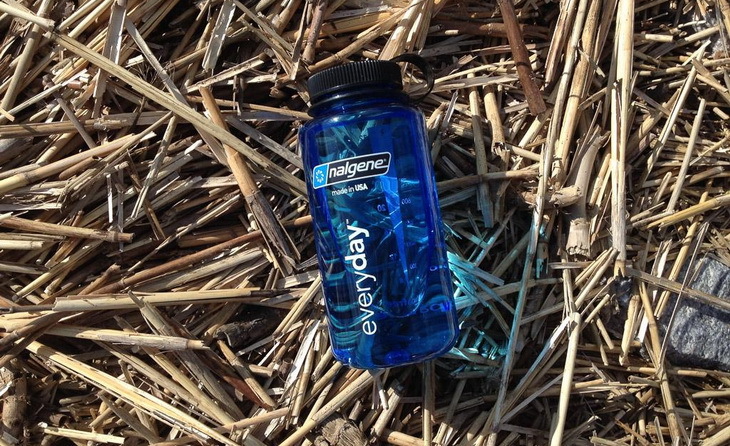 Disposable water bottles are practical, durable, and extremely lightweight. They come in any many sizes from 300ml to 2 liters. You do not have to think about their maintenance because they can be recycled. Reusable glass water bottles do not absorb any flavors, odors or chemicals which make them great if you love flavored drinks. They’re easy to clean (almost all of them are dishwasher safe) and many brands opt for a protective sleeves design to reduce the possibility of breakage. The main disadvantage of glass water bottles is that they’re heavier than plastic bottles and have more chance to break and shatter plus they’re more expensive than plastic water bottles. As you can see there are few types of water bottles. There are several bottles and if you want to find out their features and details keep reading the reviews below. As per our promise, we have handpicked a range of hiking water bottles that are deemed the best on the market because of their features. Nevertheless, not all bottles are made the same or are appealing to every hiker no matter how good they are touted. We have therefore emphasized the important features and have also highlighted the cons and the pros for each bottle. 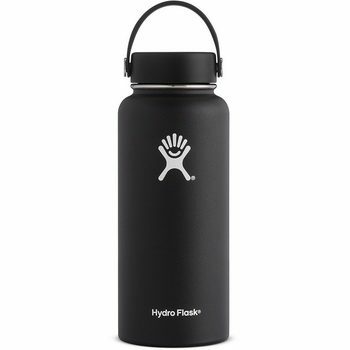 Description: This Hydro Flask CAX702 Water Bottle is made out of a premium grade 18/8 stainless steel. It is easy to clean, cools all drinks for 24 hours and keeps drinks hot for 6 hours. Although it’s a bit too heavy for longer routes (you’ll have to carry it in your backpack) and the price is steep. It provides excellent double-wall vacuum insulation performance and a lifetime warranty. This bottle has a wide mouth opening which means that you can put fruit in your water bottle and get homemade flavored water great solution for hot days. 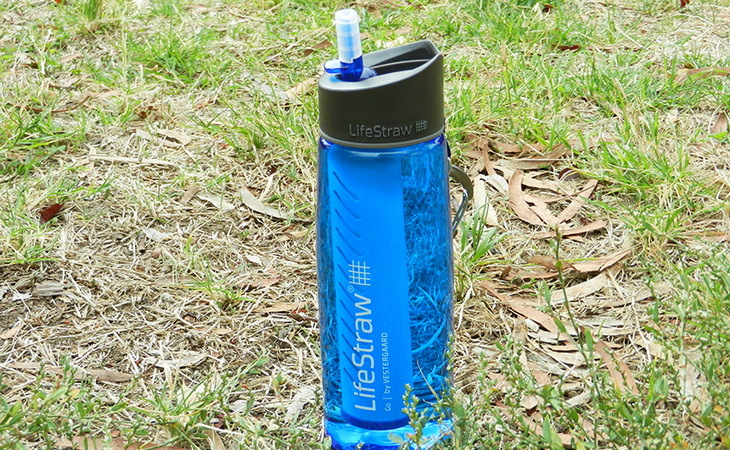 The bottle has a great straw lid and extra durability. So if you want a long-lasting bottle for all your outdoor excursions, this bottle may be the best fit for you. You never go wrong with the stainless steel unless you do not care for it to an extent of being corrosive. The best care for this bottle, is to hand wash it with hot and soapy water and then rinse and dry it. Do this after using it. It may develop some smells if you leave it for a long time while dirty. The exciting part is that it is available in many sizes and colors for everyone to choose the perfect match. Functionality is the same in all types. Compatible lids to be used for these bottles, are the Hydro Flip Lid and the Hydro Straw Lid. 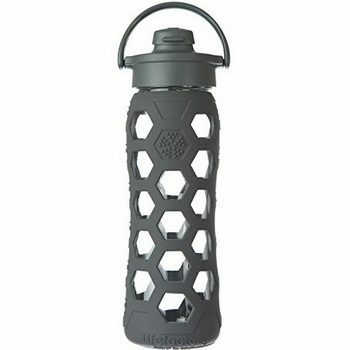 Related: To be able to hold the bottle comfortably, we recommend the Hydro Flask WaterFit Paracord Handle. This handle has an adjustable knot so it can fit almost all the water bottles for ease of carrying them. You can even stretch it to use as the rope. 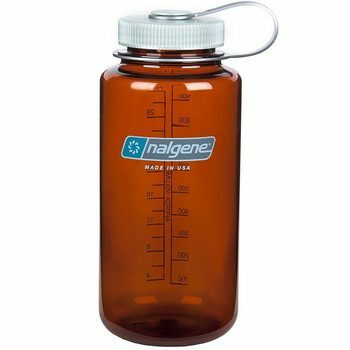 Description: This highly popular Nalgene Tritan Water Bottle is perfect for those who want the appropriate amount of fluids with them on their hike. 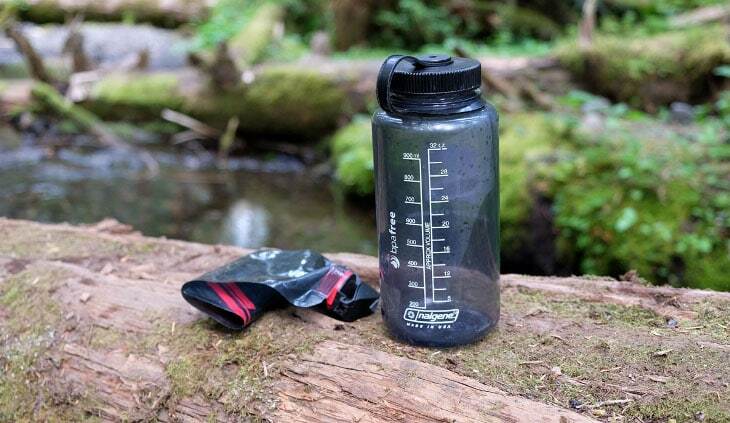 The Tritan Wide Mouth bottle comes in many sizes, but this one is perfect for hikers as it can carry enough water to keep them hydrated. It comes in various colors so you can choose the one that suit you best. It’s been one of the best-selling bottles on Amazon in the past 20 years. It’s BPA-free and is reliable as it has been tested for different environmental conditions for years now. It’s also tested for all dangerous chemicals and is proven that you’ll never get a plastic taste when drinking from this bottle. It has a lifetime guarantee and is dishwasher safe. This water bottle has a wide mouth feature which is great for easy cleaning, re-filling and adding some ice cubes and fruits for flavor. Measurement markers on the side of the water bottle will help you track your fluid intake. Plastic bottles need to be stored carefully as they can be punched by sharp objects in your backpack or they may get burned if stored unmonitored in the wilderness next to campfires. Related: Repeated uses of the bottle may see the lid fading in quality. In that case, we reckon getting the Nalgene OTF Bottle Lid. The lid is convenient to open and close and attaches securely on this water bottle. 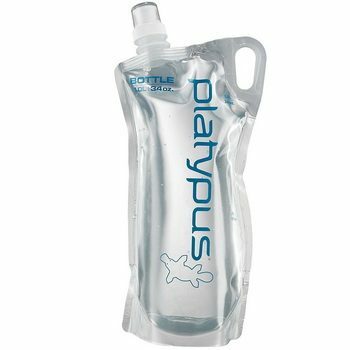 Description: This Platypus 07029 Water Bottle is one of the lightest water bottles on this list as it’s soft-sided. It is really durable for its weight and you can carry multiple bottles in your backpack. However, it’s a bit tricky to drink from because it doesn’t hold its shape and doesn’t slide easily into a backpack. But, aside from these disadvantages this is the best soft- sided water bottle on the market if you ask the professionals. It rolls up nicely inside of any backpack and is very resilient too. The bottle is BPA, phthalate, BPS and taste free. The silver-ion protects the water bottle from bacteria and mold. PlusBottle is compatible with all Platy lids and drinking tubes which means you’ll easily replace it. 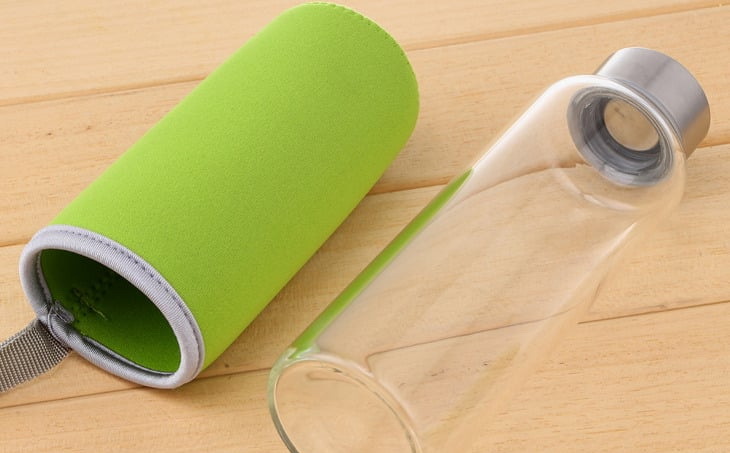 Its film is softer and more flexible, yet adds more durability to the bottle. So you will not return to the store anytime soon with the bottle. The other advantage is the ease of carrying it with the tapered midsection that provides a new grab and hang loop. You may even decide to hold it with hands instead of packing it in the backpack. Related: To drink from this pack, we recommend the Platypus Big Zip Drink Tube Kitt. The tube can make it possible to drink while the pack is stored in the backpack. It’s a great add-on than to rely on the opening. Description: This CamelBak Eddy Water Bottle is perfect for those who want a water bottle that is light and has an integrated straw which allows you easy drinking while hiking. 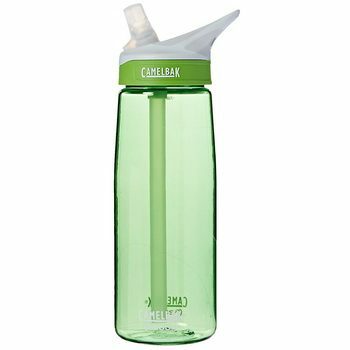 CamelBak is known for its affordable bottles and this one’s no exception. It has integrated handle which means you can connect the bottle easily to your backpack or your waist belt. The integrated handle is not included when buying a bottle, so you’ll have to order it separately. It comes in different colors, is BPA and BPS free and can be washed in the dishwasher. The design is spill-proof and has durable construction which makes it an ideal bottle for any outdoor activities, especially hiking. Camelbak also guarantees lifetime durability on all their bottles. This bottle has a redesigned cap therefore your water (or other beverage) will flow through the valve more easily. Related: It becomes easy to drink water using the straws for ease of drinking. This bottle comes with the straw, for replacement we recommend buying the Camelbak CEABV-44 Bite Valves and Straws. They come in a pack of 2 and are affordable. Description: If you want BPA-free, scent-free, PVC-free bottle, then this Lifefactory 236002 Water Bottle with silicone sleeve, bottle is for you. Many hikers prefer glass water bottles because they don’t preserve any odor and any metallic taste that stainless steel bottles can leave. If you’re one of them this water bottle should be your number one choice. The only disadvantage this bottle has is that it’s not all that durable. Even the silicone sleeve won’t save it from breaking if it drops from a good height. It’s dishwasher safe and reusable. It offers a large capacity of fluids which means you won’t have to refill it that soon. It also features a wide-mouth opening which means it’s easy to add pieces of fruit, ice cubes and mixing powders. It’s BPA and BPS free and has a controlled flow through a medical-grade silicone flip top seal and polypropylene cap with pivoting handle. Cleaning this bottle is easy because it is dishwasher safe. Glass is advantageous because it doesn’t expose you to nasty smells like other materials do such as stainless steel bottles if not cleaned regularly. That’s the good part of having this bottle. Despite being covered with the silicone sleeve, a glass bottle is always a challenge to handle if it can fall from high positions. It can break, so durability may be a concern. Related: If you are not a fan of drinking directly from the bottle, we recommend purchasing the Lifefactory 330100 Protective Silicone Sleeve so you can pour fluids easily from the bottle for consumption. These glasses are also covered with silicone sleeve to reduce the chances of them falling. 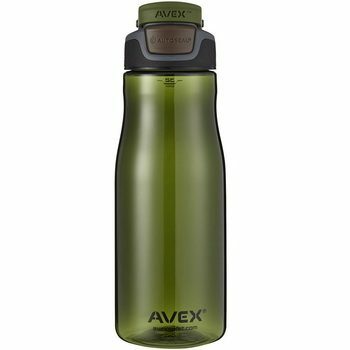 Description: This brand is a bit unknown but hikers who tried this Avex Brazos Water Bottle, are satisfied and would recommend the brand to everyone. It has gained good reviews on Amazon, especially the Brazos line. The main advantage of this bottle, is that it comes with an auto seal function which means that whenever you’re using it you have to push the button on the cap that will open a spout. The system works seamlessly, easily, and doesn’t spill anything. It keeps your fluids protected from germs and dirt. It is easy to clean and has a large capacity, which means you won’t have to refill it as much as you would other bottles. The bottle is BPA-free and has a clip-on handle, so you can attach it to your backpack or waist belt. It’s also dishwasher safe. The con of every plastic bottle is the possibility of getting burned if not kept safe around camp fires. Related: This plastic bottle may not be good in insulating your hot drinks if camping in winter. The company has the AVEX Sundowner Rocks Glass to couple with this bottle. 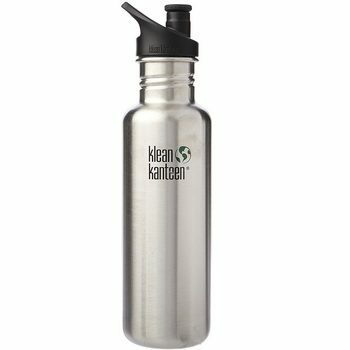 Description: Klean Kanteen is a very popular brand so there’s no wonder that their Klean Kanteen Classic Water Bottle is popular amongst hikers. 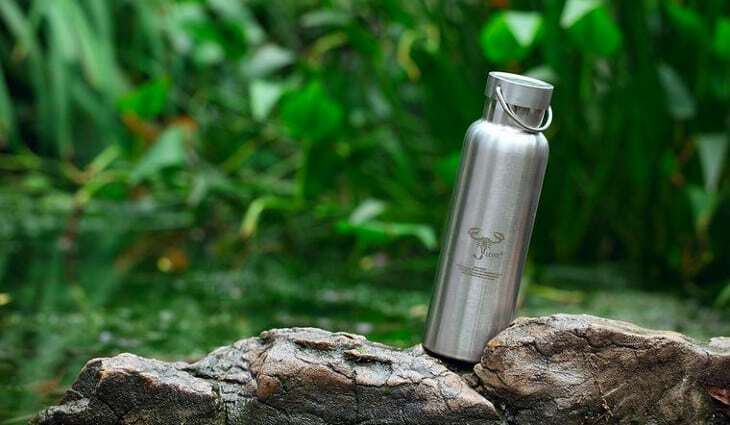 This 20 ounce water bottle is very light (you will avoid unnecessary weight in your backpack) and is made out of 18/8 food grade stainless steel. The bottle has a loop cap, which allows you to hang it on your waist belt or your backpack. It comes in a variety of colors and is phthalates and BPA-free which means you will be safe from any toxins. It also has a 100% stainless interior and does not retain any flavors or odors. It has rounded corners that are easy to clean so there’s no chance that dirt or any other bacteria will stick to it. Stainless steel bottles have a good durability compared to glass and plastic bottles. Even if they get exposed to heat, they won’t shrink. Related: The cap can get broken, especially when you take the bottle to the wilderness. We therefore reckon buying the replacement Klean Kanteen VGMYO Caps. We have reached the end of our article and by now, you must have realized that even on short hiking trips, water is an absolute must. You need to carry enough fluids to keep hydrated, healthy and strong or you will find yourself in a dangerous position in the nature. That is why it is imperative to have a reliable and dependable hiking water bottle to rescue your dehydration. We are confident that you have found the best water bottle for your hiking adventures from out list. We provided the different types of bottles with their features to help you choose. Also, related accessories are being emphasized so that your chosen product is more versatile. Your buying decision will be influenced by the features you are prioritizing. Have we included every important bottle you know? If not, please feel free to leave a comment in the comments section below. Leave questions as well. Best Quickdraws: Climbing Trips With Top Safety Gear!